This is my new extruder hot end. After enclosing my printer with an insulated box, I decided that I needed to drop more heat before the plastic entry side of the end of the barrel. 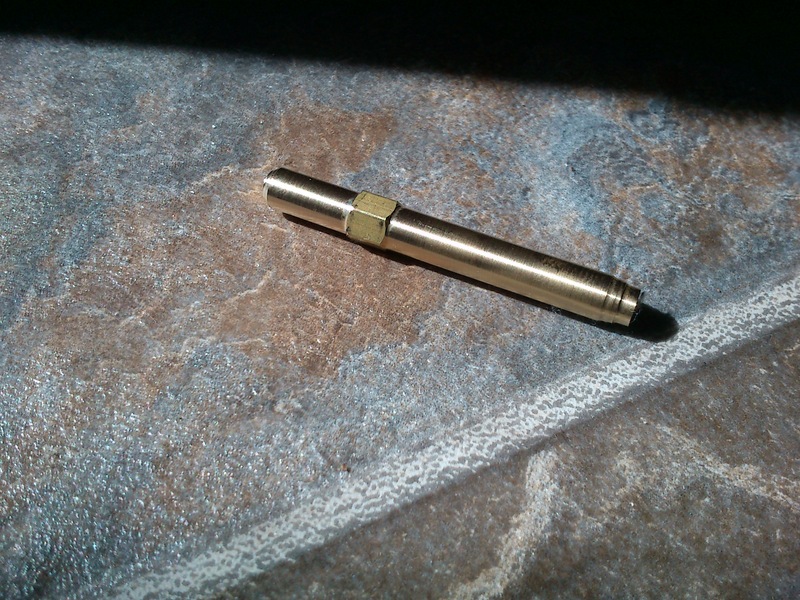 I accomplished this by turning an extra long barrel out of brass, and a small heatsink out of aluminum to go between the heater and the Groove Mount. 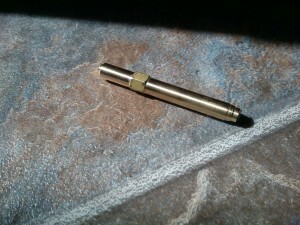 The barrel was straightforward to turn out of a piece of 1/4″ hex stock. I put the threads on with a metric M6x1 die. 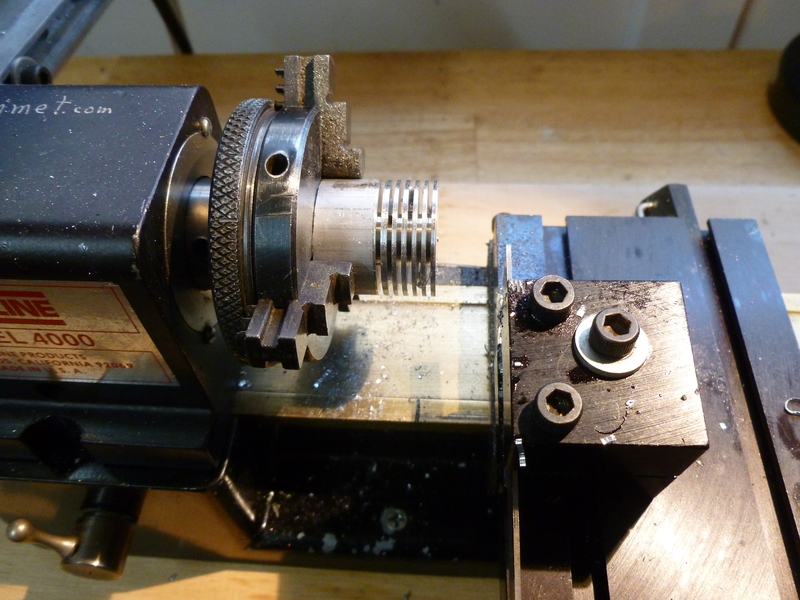 The HeatSink took more time, mostly because I had to cut the fins out of a 1″ diameter rod quite deeply with a cut-off tool. After building an insulated cover for my 3D printer, I decided that I needed to put some lights inside. 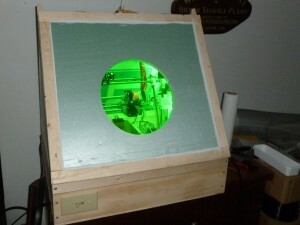 This allows me to see how the print job is progressing, both via the porthole, and via the interior webcam. Because green surplus neon tubes for computer cases are inexpensive and take 12 volts, I riced up the cover with two green neon tubes. 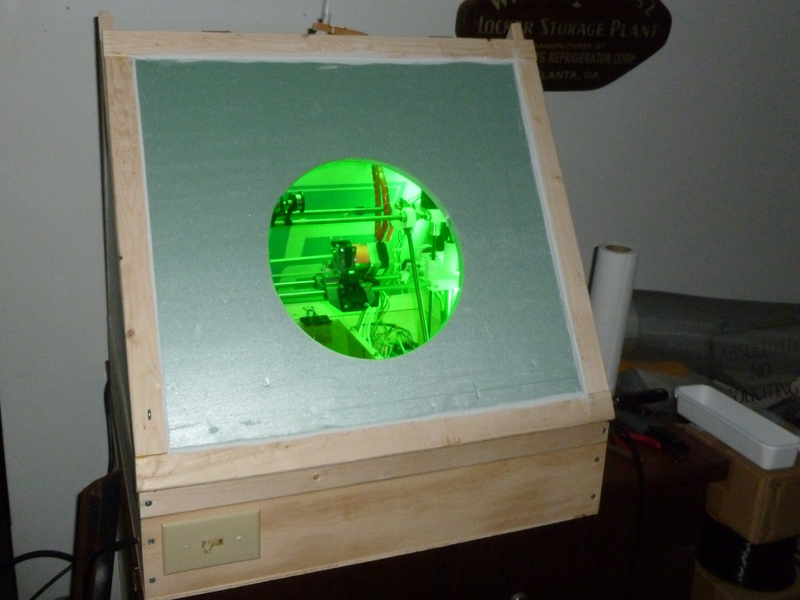 The color complements the light teal of the foam insulation nicely, and gives my Garage Laboratory an evil green glow at night. 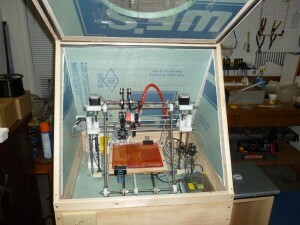 My 3D printer lives in the garage. 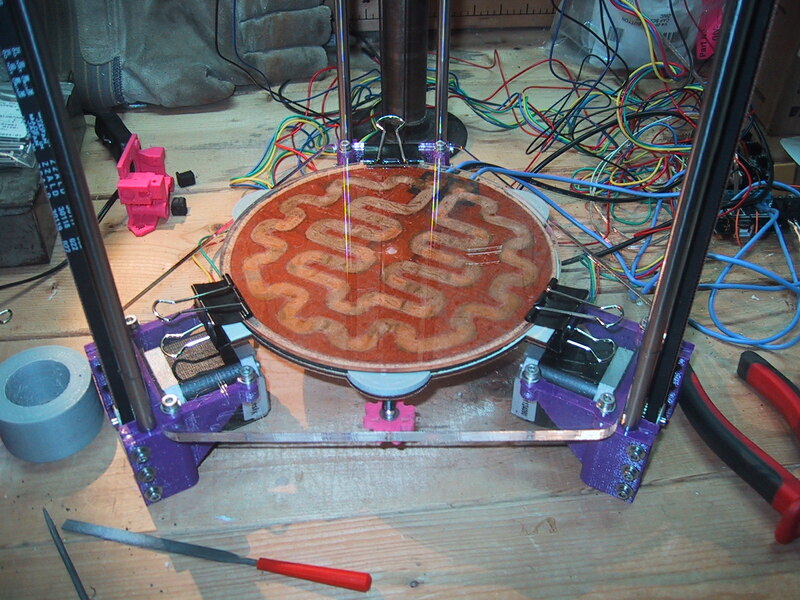 I use it to print ABS plastic, so the smell needs to be out there. 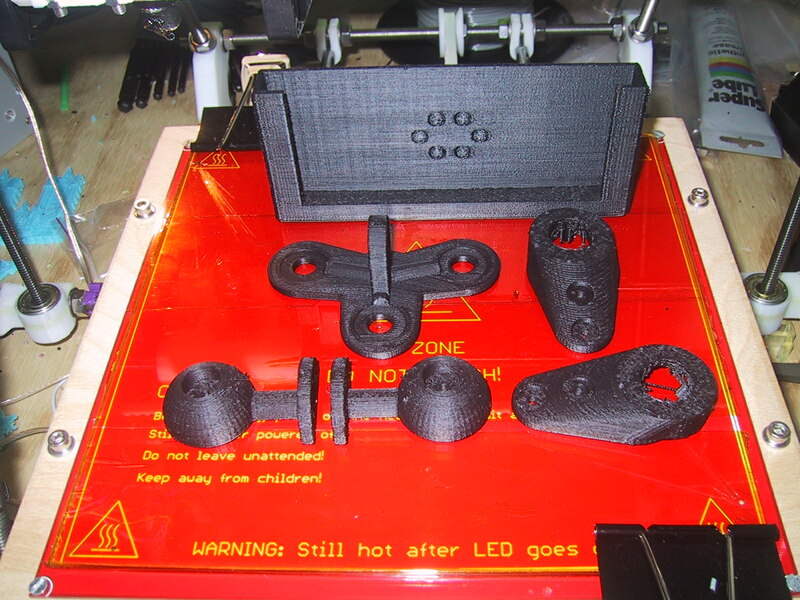 However, as my garage is unheated, I have problems with ABS prints warping and cracking, especially during the winter due to the cold air around the part as it is printed. To solve this problem (and get better performance even in the summer) I built an insulated cover for my 3D printer. I brought my rostock-mini 3D printer home so that I could take it to a class, and while I had it here, I decided to update a few minor things. 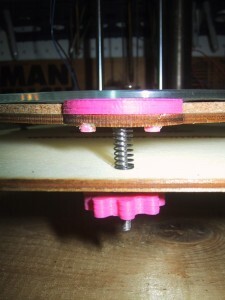 Second, I upgraded the springs on my adjustable print bed to some that were a bit taller and a bit stiffer. 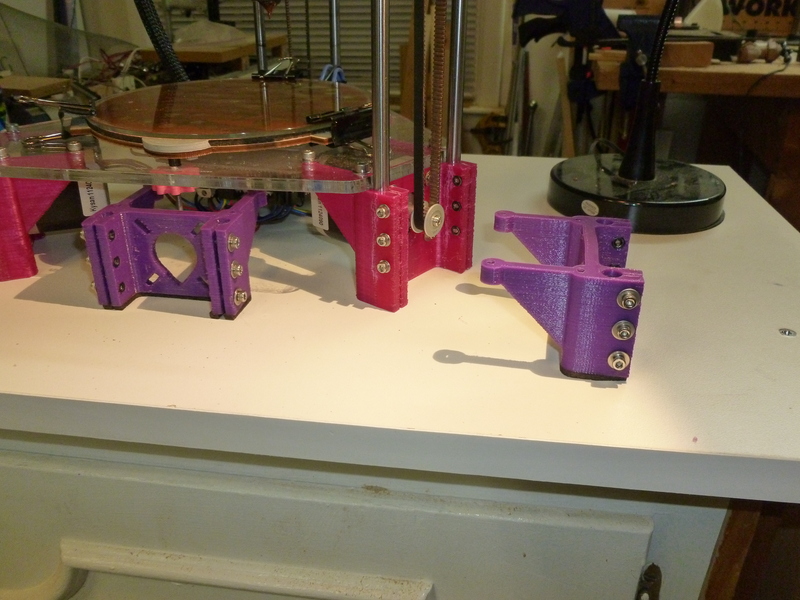 My overall build volume was shortened from 187mm to 185mm, but now I have a lot more range for adjustments and the bed is more rigid (while still allowing the print head to push the spring loaded bed down if it crashes horribly). 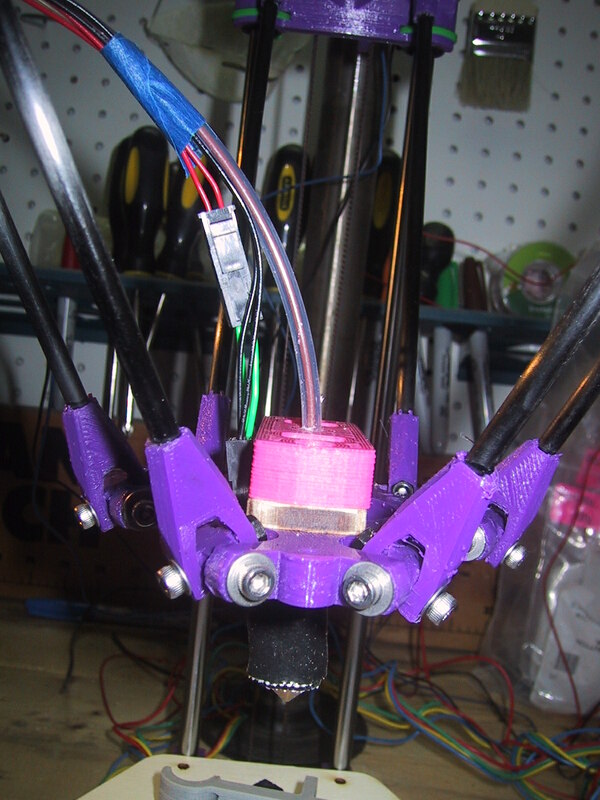 Third, I wrapped some plastic spiral wire harness wrap around the wires leading down to the print head, to give them a better visual appearance. Finally, I changed out my bowden tube from using M4 nuts to hold the tube to using screw in Push To Connect adapters. The goal was to allow me to remove the tube from either end without having to unscrew the plastic part holding the nut in place. 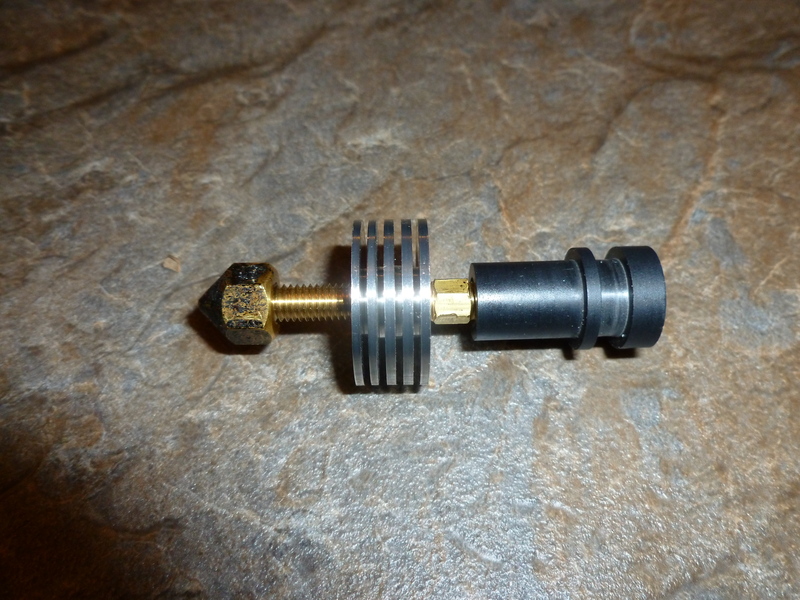 However, the cheap PTC adapters I bought appear to be single use, in that they don’t release the tube reliably without breaking, so basically it just makes the bowden tube look slightly more professional. 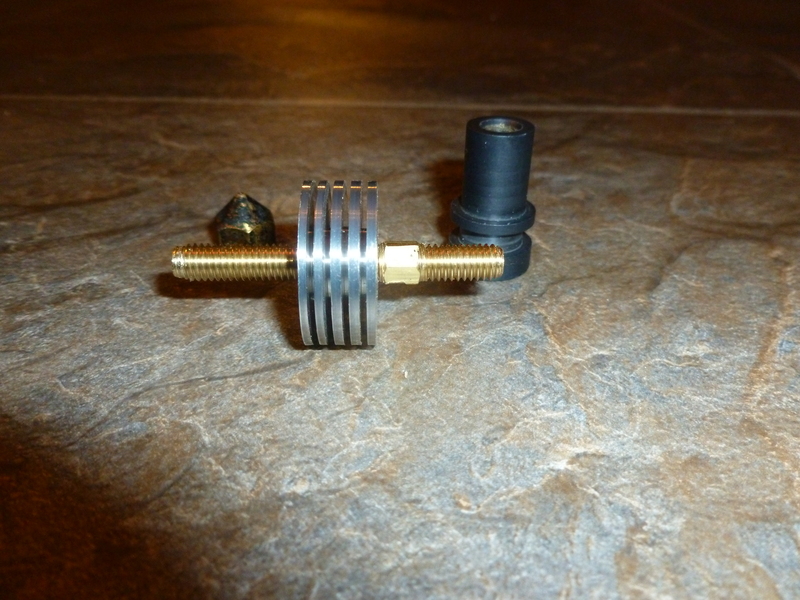 I recently replaced a MakerGear hot end with a different model (MG Plus) but wanted to maintain the same connectors (used for the resistive heater and the thermocouple). The MakerGear connectors had a positive locking clip, while the JST connector that came with the MG Plus thermocouple was only friction fit. The female connector (with the bump) is a Molex 0436450200 (DigiKey part number WM1845-ND). The cartridge heater on the MG Plus nozzle came with enough wire to reach all the way down to my RAMPS board so I ended up only using the molex connectors for the thermocouple, and running the resistive heater wire all the way down. This left me with a set of wires going to my hot end terminating with a molex, and I eventually plan on using this for an “always on” fan for cooling the top of the hot end (as opposed to the “under RAMPS control” fan for layer cooling). 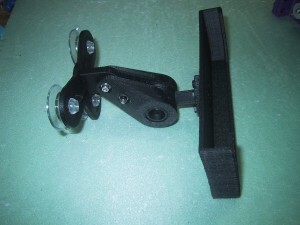 This is a windshield mount for a (landscape mounted) cell phone that I designed and built. 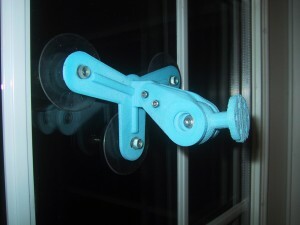 It has a ball & socket mount for easy adjustment. The rectangular holder on the end can be customized to any cell phone. And the whole thing takes about eight hours to print. If you want to print your own, I posted the design files on thingiverse. This is a zip file of the rostock-mini firmware that I am currently using. The only changes I made to it were to update the files to compile with Arduino 1.0.1 and modifications to the configuration.h file to work with the rostock mini. 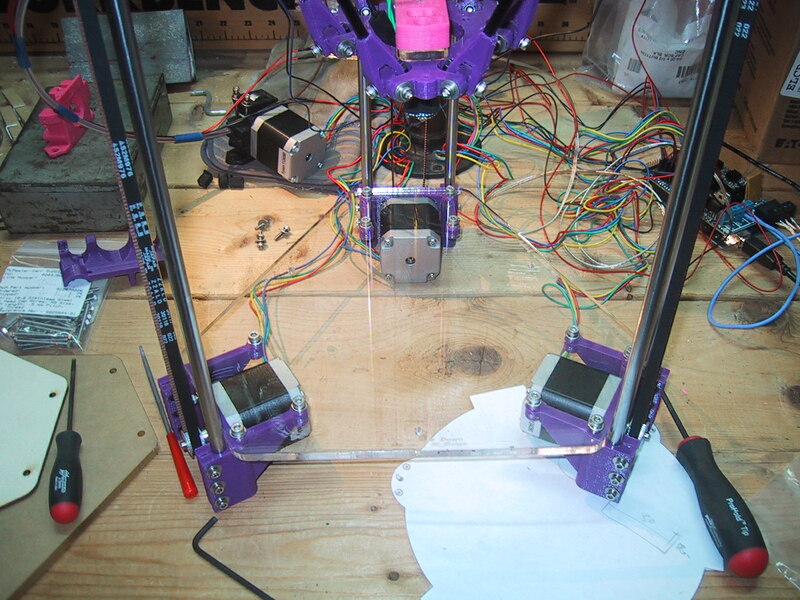 After replacing the 1/8″ plywood temporary base and top frame plates with the final 1/4″ acrylic , my rostock-mini is working very well! The extra rigidity in the frame has greatly improved it’s positioning accuracy and it’s making prints that rival my Prussa Mendel for quality. 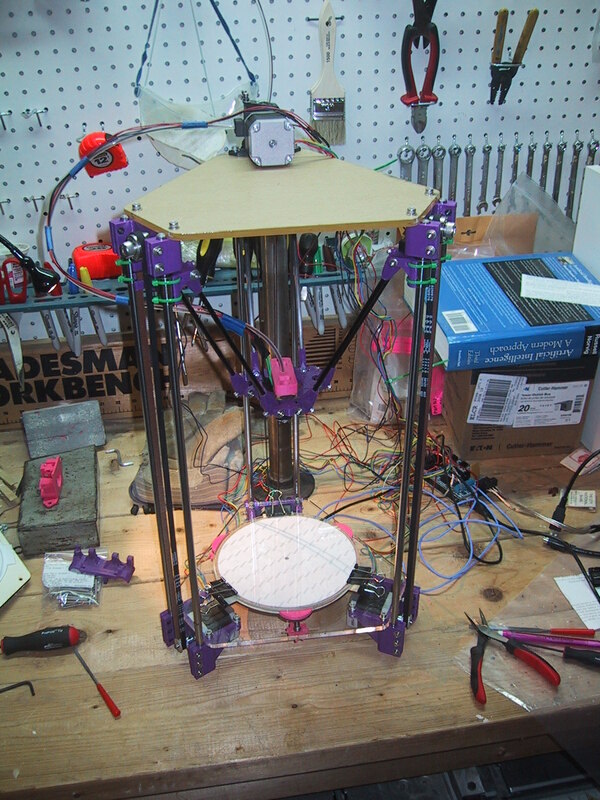 The video above shows my round print bed and spring loaded adjustable levelers in action, as well as a close up of the delta bot motion. 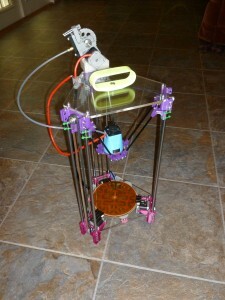 This is a picture of the clear acrylic base plate before I added the print bed holder to it. 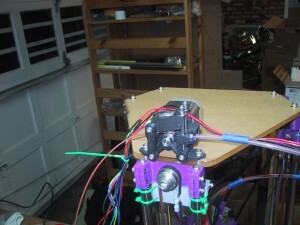 Here is the complete printer with the adjustable print bed. 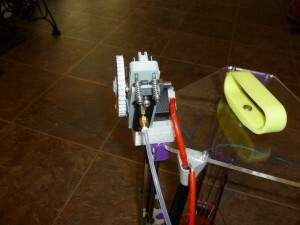 I mounted the airtripper v3 bowden extruder cold end on the rear of the top plate. As it turns out, the M6 screw holes on the extruder are close enough to the right distance apart to match up with the idler top end printed bracket, so I can use the same M4 screws (with fender washers) to hold the extruder cold end as well as hold the top plate to the idler bracket! Once I saw that bit of luck I gave up all thoughts of mounting the extruder under the bottom frame plate. 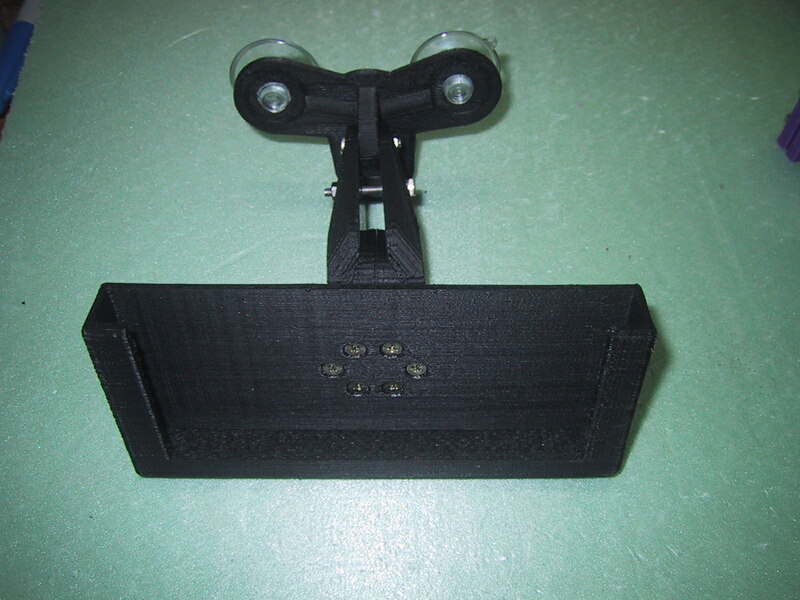 The rectangular areas are where binder clips attach. 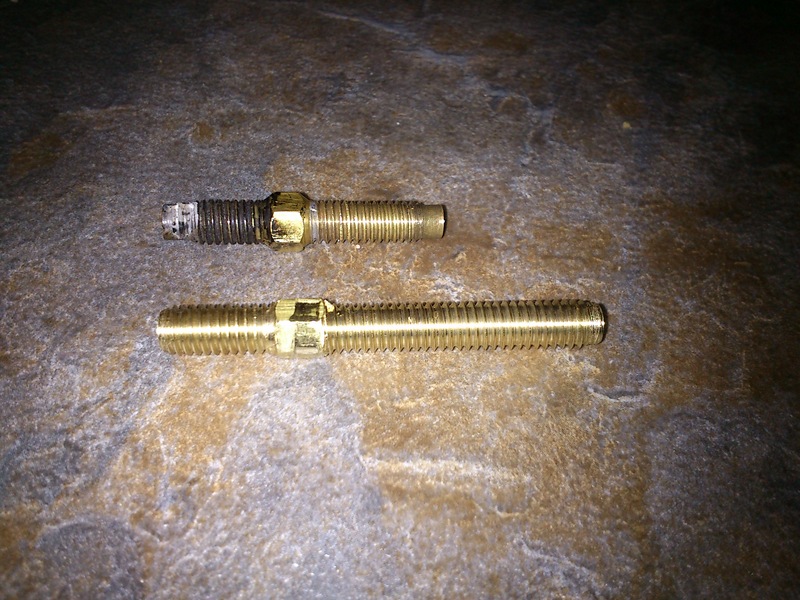 The holes in the rounded tabs are for a hex bolt and the two rectangular slots are for pins from a plastic piece that keeps the bolt head from turning. (This allows a knob to turn on the bolt as a hight adjuster.) 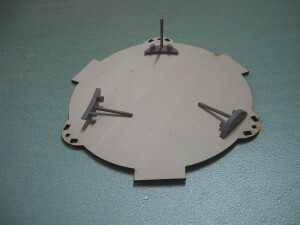 A piece of adhesive cork acting as insulation sits between this plate (which will be cut from 1/8″ birch plywood) and the glass build plate. 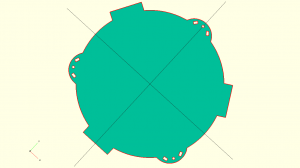 The glass plate provides the structural rigidity and provides for a nearly flat build platform. If you want to replicate this, all my design files are on Thingiverse, #63414. 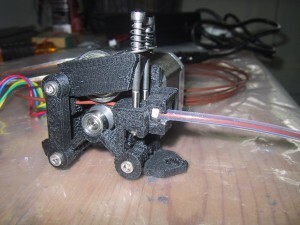 I finished the bowden tube extruder for my Rostock Mini build. It uses airtrippers V3 Bowden extruder for the coldend, a makergear hot end, and the rostock-mini hot-end holder. I can actually print things with the rostock-mini, and say that I built a 3D printer using my (other) 3D printer. 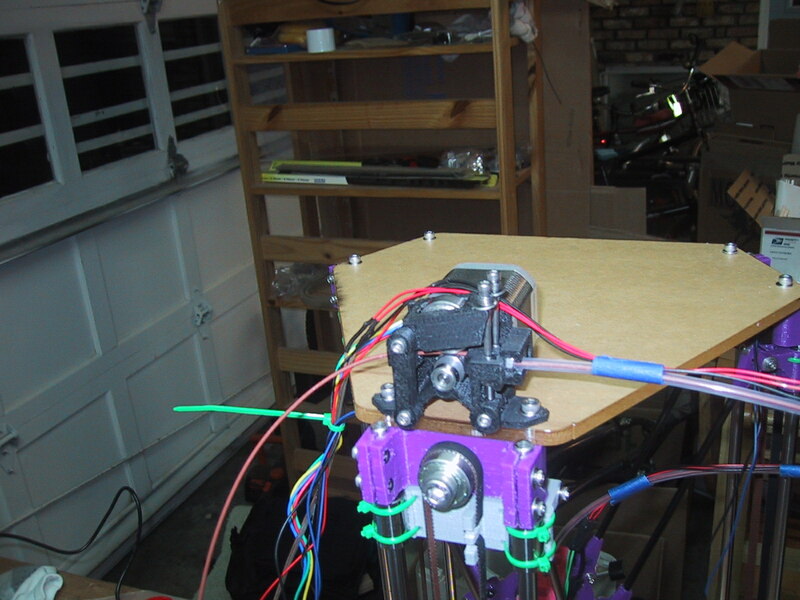 However, I have a lot of work to finish up before the printer is done (or even prints well). Now that I have all of the parts working together, I need to finalize the mounting position of everything, then I can laser cut the final 1/4″ acrylic top and bottom plate with all the appropriate mounting holes. 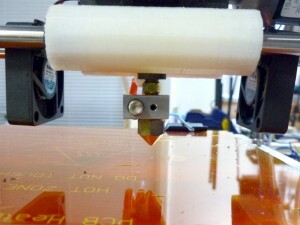 I think I will be putting the airtripper extruder on the top plate, as opposed to under the body of the printer. 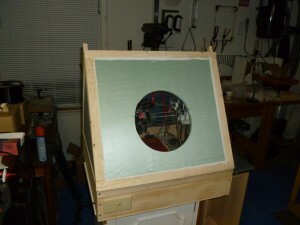 I may also rig up a spool roller on the top as well. 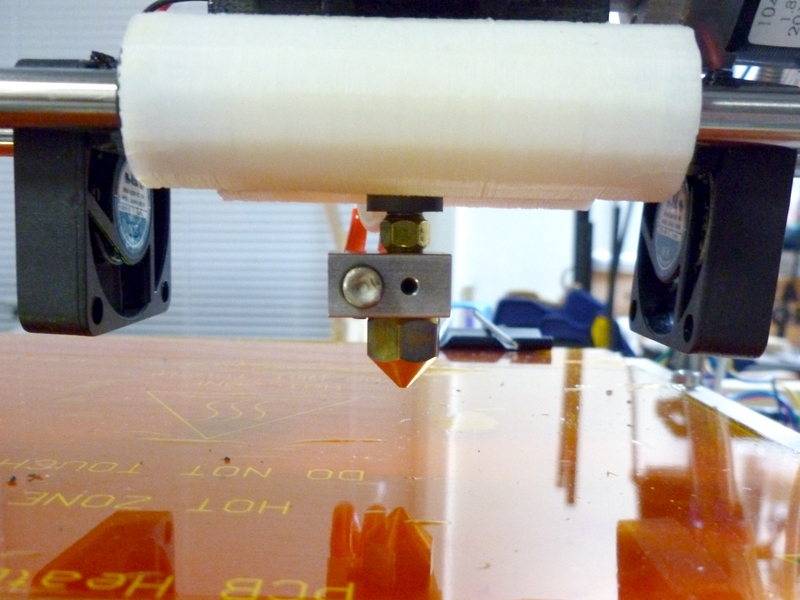 The 1/4″ acrylic (vs the current 1/8″ birch plywood) will give the printer a lot of needed rigidity. I also have to play with using the set screws on each carriage to adjust the height of the extruder head over the entire print surface, and determine exactly how I want to mount the glass build plate and bed heater.